The data on irrigated agriculture in Egypt has been compiled from NBI projects and global data sources notably from FAOSTAT (FAO). These values haven’t been validated with ground observation as this was not available at the time of preparing the Atlas. 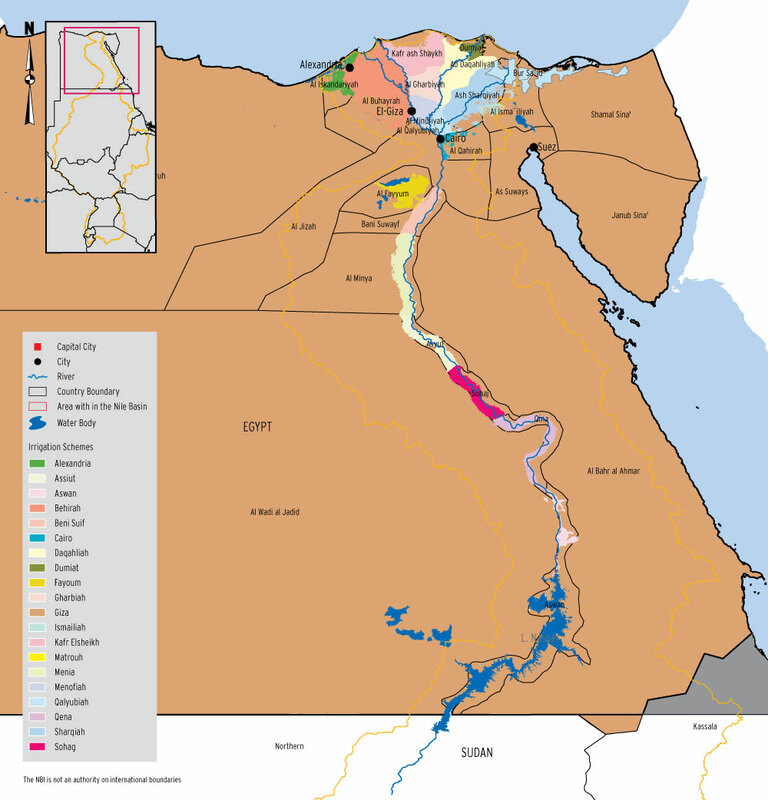 Egypt has the largest irrigation area among Nile Basin countries. The total area equipped for irrigation in Egypt is estimated at 3.45 million hectares (3.4% of the total area of the country) and a cropped area estimated at about 5 million hectares. 85% of this is in the Nile Valley and Delta. The estimated cropping intensity is 146%. The irrigation system in the old land of the Nile Valley is a combined gravity and water lifting system (lift: about 0.5-1.5 m). Most of the water used in irrigation in Egypt is surface water with some water taken from groundwater sources. Estimates of water used for irrigation by NB states based on globally available data sources show that an average of 66 BCM per year is used for irrigation where 57 BCM per annum is supplied from the Nile while the remaining 8.5 BCM supplied from groundwater and re-use of drainage water from agricultural fields. The irrigation system in the new lands (reclaimed areas) is based on a cascade of pumping stations from the main canals to the fields, with a total lift of up to 50 m. Surface irrigation is banned by law in the new reclaimed areas, which are located at the end of the systems, and are more at risk of water shortage. Farmers have to use sprinkler or drip irrigation, which are more suitable for the mostly sandy soil of those areas. Egypt’s irrigation system extends some 1,200 km. from Aswan to the Mediterranean Sea and includes 2 storage dams at Aswan (the Low and High Aswan Dams), 7 major barrages on the Nile that divert river water into an extensive network of irrigation canals. This includes 13,000 km of main public canals, 19,000 km of secondary public (Branch) and 100,000 km of tertiary private watercourses (mesqas) that form the main distributaries to farmer’s fields. Complimentary drainage networks cover about 272,000 km with 17,500 km of main drains, 4,500 km of open secondary drains and 250,000 km of covered secondary & tile drains. Holdings average less than 1.9 fed (0.8 ha) one of the lowest in the world. The most limiting resource for Egyptian agriculture is irrigation water. Management of its water resources has always been a central feature of the country’s development strategy.